We had the joy of hanging out in Disneyland or a week this summer, and discovered how to spot more characters in Disneyland by accident. My discoveries this summer will hopefully help you to give your kids an even better time in the park on your next vacation to Anaheim. In the past, both finances and time had only allowed us to have a day or two tops in the park. This year we managed to have 4 days in the parks, and that was plenty for our family for one trip. The last few visits I had made to Disneyland didn’t include seeing many characters. I was actually disappointed since I thought they would be everywhere. This time since I could slow down and relax a bit more, I was able to notice more of where they were located. So, here I am read to share with you! Hang out near the front of the park between 10am and 12noon. This seems to be prime time to spot your favorite characters. 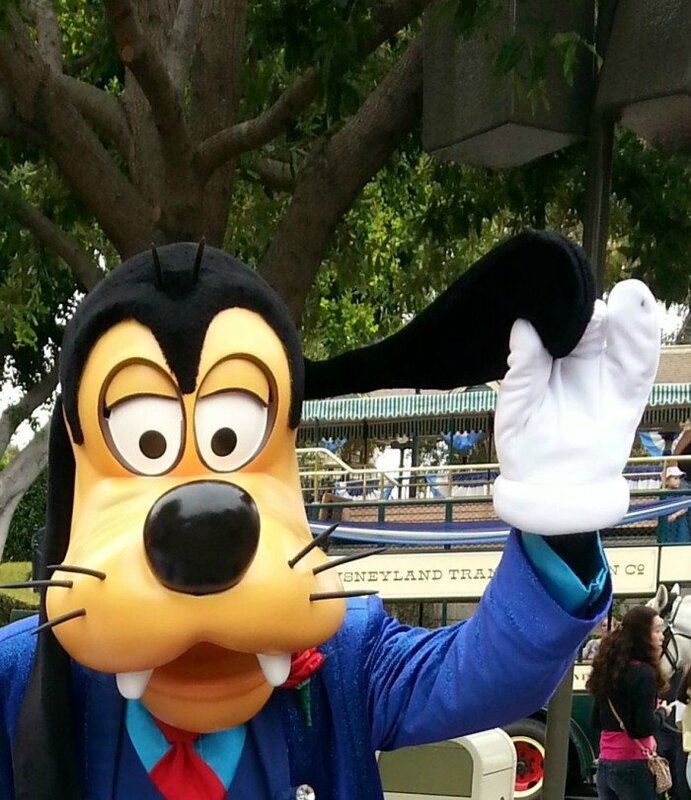 Not only will Mickey and Minnie be out, but Goofy and Pluto are almost always out during this time period. Donald Duck and the Princsses or Prince Charming sometimes roam around this area in the mornings too. Look around the area between the Train Station and the Mad Hatter or Disneyland Fire Department for lines and you’ll likely spot a few characters. Visit Fantasy Faire for Disney Princesses. This area is between Main Street and Fantasyland and has great events with some of your favorite princesses all the time. This is the one place you may spot Elsa and Anna from Frozen inside Disneyland. You’ll see Cinderella, Snow White, Sleeping Beauty, Prince Charming and occasionally Rapunzel here. Check the listings in your park map for the day to see if there are any special events happening. You can plan to be there with your kids and enjoy a chance to sit down for a few minutes while they get to see their favorite characters. Explore Innovation in Tomorrowland. The Avenger’s are new to the Disneyland character list, but they may be some of the most beloved right now. Thor, Captain America, Iron Man and even the Black Widow have all shown up in Innovations for special promotions or just to walk around. You’ll also see a good number of Jedi Knights and Storm Troopers in this area all day long. Sometimes in areas like this the best way to spot more characters in Disneyland is to just sit back and observe until one passes by you. Pay for the character breakfast. If your kids really want a personal experience with a character this is the way to go. Not only will you get that up close and personal time, you won’t be rushed like you are when you stand in line to see a character around the park for a picture and autograph. The Plaza Inn breakfast is around $20 a person, but the food is out of this world good. Tons of different characters go in and out throughout the buffet from 8am-11am. If not everyone is interested, one parent can take the kids that do want to meet characters while the other parents heads out to rides, etc. with the rest of the family. Go to the afternoon parade. The late afternoon parade is chock full of characters. You won’t necessarily get the autograph or personal picture with a character, but you can see tons of characters in a short amount of time. Make sure to grab your spot early so you can be on the front lines for best pictures and kids experiences. 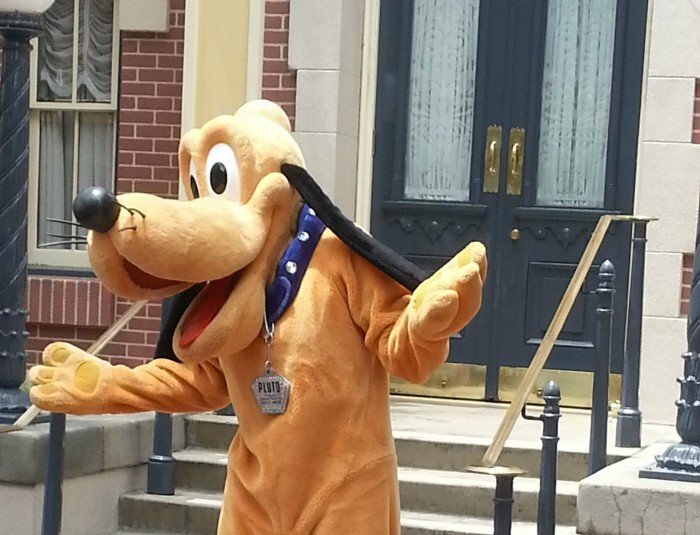 These tips for how to spot more characters in Disneyland are great for the families with kids just dying to see their favorite Disney character live in person. Since our son is a bit older, he isn’t into the characters as much, but he does love the idea of getting his picture taken. I personally loved my photo opp with Goofy since he was such a gentleman. 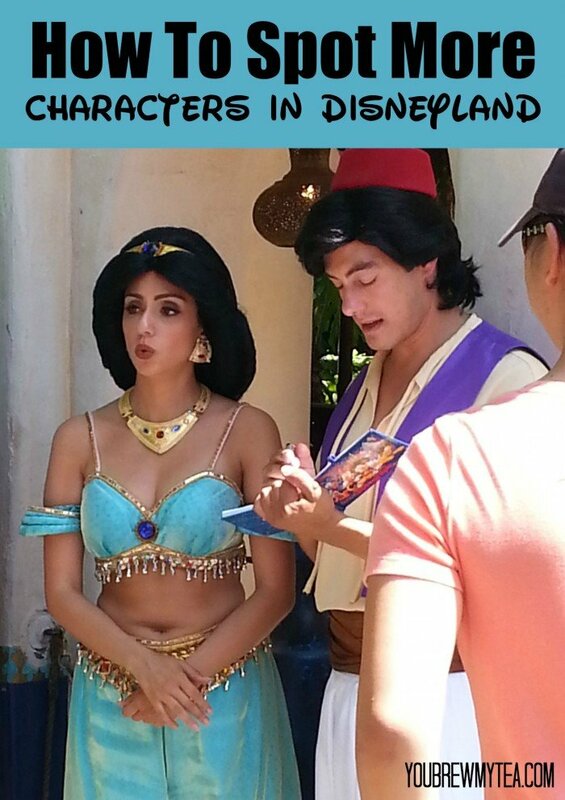 Check out our other Disneyland travel tips! Great tips- I remember going to Disney World as a child and more characters just being there on the street. admittedly, that might just be the way it seemed as a child. I know in Disney World they are starting to plant more characters out and about, so I’m hoping it’s a trend that continues at all the parks! Thanks for sharing your tips to guarantee a great trip in the mean time! I never went as an adult,so I don’t know from personal experience. My Beau went and said they use to be much more random at Disneyland though. We just went to Disneyland too! My kids are older, so we didn’t have to look for characters, but I know they have certain places and times they are at their stations. We were looking for Minnie Mouse and a staff member was able to tell us exactly where she was at that time, so we didn’t have to go searching. Such great memories! If you want to read about our trip, here is the link – http://homeonthecorner.com/2015/08/03/what-we-did-on-our-summer-vacation-part-2/. Sounds like a great vacation to me too! Great tips! I can’t wait to take my kids to Disneyworld! Great Tips if I ever get the chance to go to Disney I would keep them in mind. Thank you for linking up on the #HomeMattersParty. Come back and share again next week. Thanks for letting us participate! Also if someone in the group owns a smartphone, there is a free app to download telling you where the characters are on the disneyland map and the wait times. We used this when we went recently. Thanks for sharing!! Id didn’t know that! I have friends heading to Disney with small kids for the first time soon. I will have to share this great advice with them! Thanks for sharing at Welcome Home Wednesdays!